All JARD Firearms — Jard, Inc.
12 gauge semi-automatic bullpup style shotgun. Accepts 2 3/4” and 3” shells and uses Saiga magazines. Weighs in at 8.25 lbs. and has an overall length of 26.875”. The JARD J16 is a complete AR-15 upper with folding stock, reducing the rifle’s overall length for transport or tight spaces. The JARD J19C is our lightweight carbine, weighing in at only 5 lbs. without skeletonization. This rifle features an over-sized left side charging handle for ease of use with optics, as well as M-loc compatible slots for accessory attachment. The JARD J22 is a .22 Long Rifle carbine upper receiver assembly for AR-15. Features a flat top A3 billet aluminum upper receiver with built in Picatinny accessory rail and comes with magazine. Fits on any AR-15 Mil-spec lower. The JARD J24 is an AR complete upper receiver chambered in your choice of .223 Wylde or .204 Ruger®. It features side charging for easy use with optics and a 22” fluted barrel. Non-restricted classification for Canadian gun owners, Canada FRT# 147862. Chambered in .223 Wylde with an 18 5/8” barrel. Comes with a 5 round magazine. 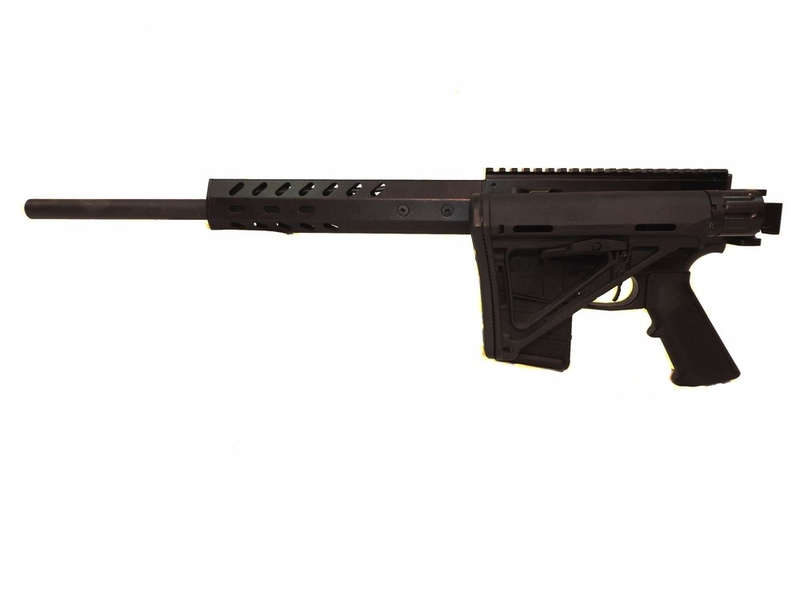 The JARD J68 is our bullpup style pistol caliber carbine. It measures 26 1/4” in overall length with a 17” barrel and weighs only 7.5 lbs. (9mm model). It features an easy clam shell break open design, accepts Glock magazines, and bottom case ejection. The JARD AR-15 Lower is Mil Spec, billeted from 6061 Aluminum for a durable yet lightweight lower receiver, and features an integrated trigger guard. Available either stripped or complete (including pistol grip and buttstock assembly). The JARD J1022 is our .22LR semi-automatic rifle. It features a built in Picatinny rail on the receiver, hogue or laminate stock options, many barrel options to choose from, and of course, exceptional JARD trigger performance. The JARD J1023 is our bullpup conversion kit for the Ruger® 10/22 rifle. This shortens the overall length of the rifle to 26 18” and weighs only 6 lbs. fully assembled. It features a free float barrel configuration for both standard and bull barrel contours, an easy clam shell break open design, and exceptional JARD trigger performance. The JARD J1024 is the familiar feel and aftermarket compatibility of the 10/22®, the performance of the .17 HMR cartridge and JARD’s exceptional trigger performance all wrapped into one great shooting rifle. Available in two stock types and three barrel types to fit your style.